Come out with your entire family to Busch Memorial Conservation Area on May 4th and enjoy a day of fishing and activities. This Fishing Day is open to all Troop 25 Scouts and their families with no signups required. 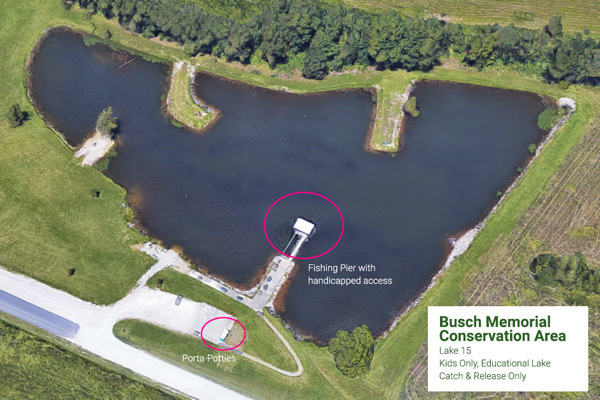 We have exclusively reserved Lake 15 which has a fishing pier/dock with handicapped access, bathrooms, picnic tables (see attached map). This will allow the Troop 25 scouts to work on their fishing/fly-fishing merit badges but also let the entire family enjoy the day. Fishing License: Everyone 16 years or older that is fishing is required to have a fishing license. Fishing Bait or Lures: We will have worms available to use, but feel free to bring your own bait or lures. Other Activities: Bring out your bikes and go riding, or just go hiking around the area. Mandatory Meeting for Scoutmasters and Committee Chairs, key committee staff.